This property provides luxury on an immense scale – and represents a majestic venue to rival and eclipse any other luxury resort in the world. Costing 3 Billion USD to build the property, using 20,000 workers over a 3 year period, it is 1km from wing to wing.The private beach is 1.3 km long, and there is a 6.4km jogging trail. To serve the requests of guests there are 128 kitchens and pantries, who will use 5 kg of pure edible gold per year for decoration mainly on deserts. A total of 200 tonnes of oranges are squeezed for fresh juice every year. 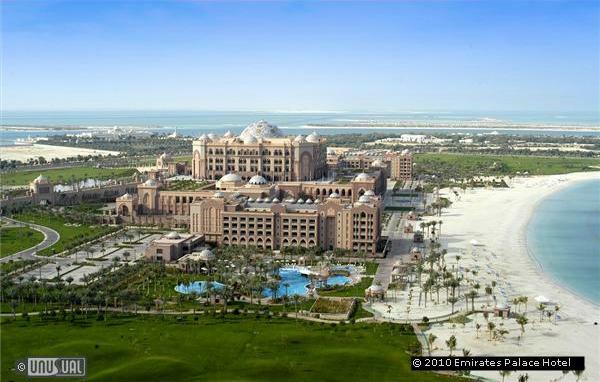 The property takes its design cue from Arabian regal splendour and is topped with 114 domes - the Central Dome at a height of 72.6 metres above ground. 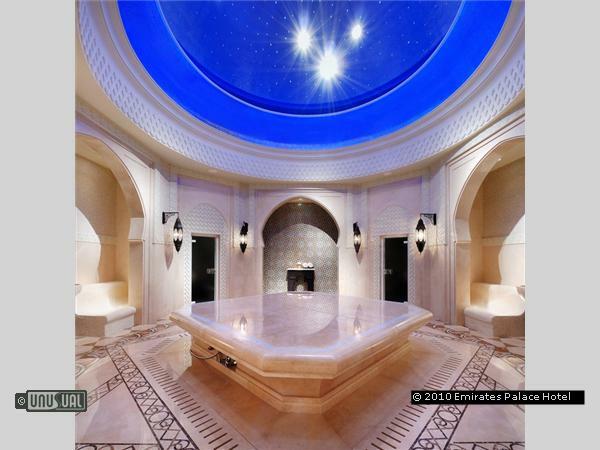 Using marble imported from 13 countries across the world, there are 12 external fountains and 8 indoor water features. 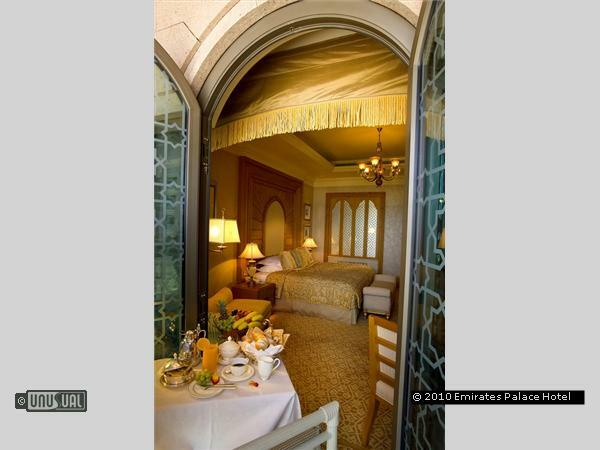 All rooms & suites have private balconies / terraces respectively. Of the1002 chandeliers, the largest weighs an astonishing 2.5 tonnes. 8000 trees were planted in 85 hectares of landscaped gardens. 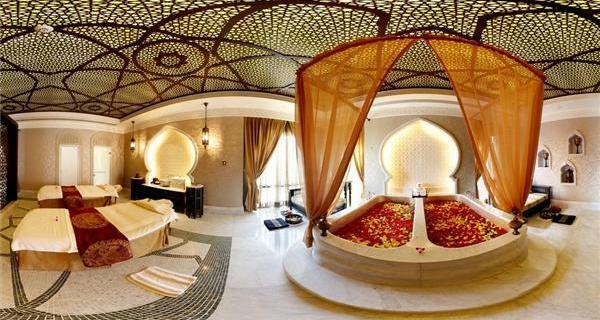 Each of the exceptional rooms and suites provides guests with uncompromising indulgence. 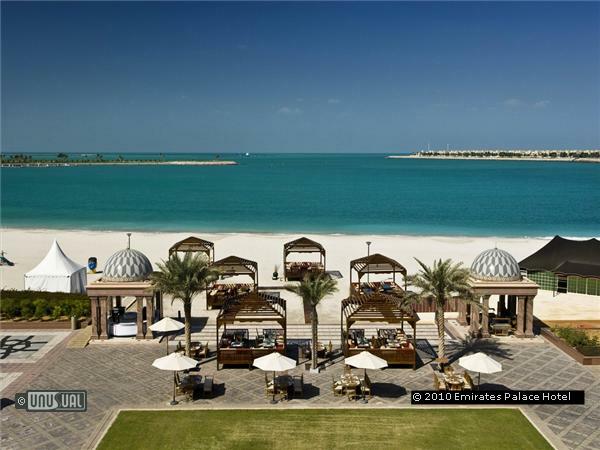 These include 302 Grand Rooms, 40 splendid Khaleej & Khaleej Deluxe suites, 4 Royal Khaleej suites, 16 three-bedroom Palace Suites divisible into a total of 48 one-bedroom individual suites. 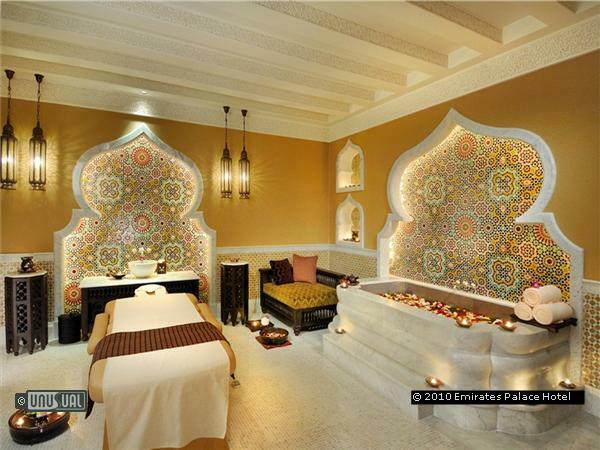 The Grand rooms, Khaleej & Khaleej Deluxe Suites & Royal Khaleej Suites are divided equally within the East & West Wings. 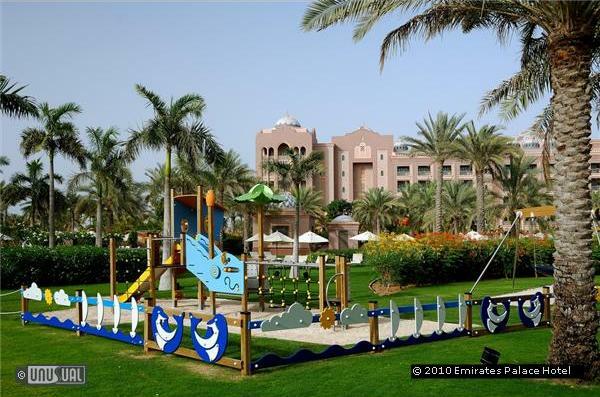 Both Wings enjoy their respective Reception area, Beach Access, Swimming Pool, & Fitness Centre. The exclusive Palace suites are located in the centre of the Palace section itself and therefore provide the guest with ideal location whether for business / leisure requirements. Providing one of the most luxurious meeting facilities in the area, it can accommodate 1100 in the auditorium and 2400 guests in the ballroom. 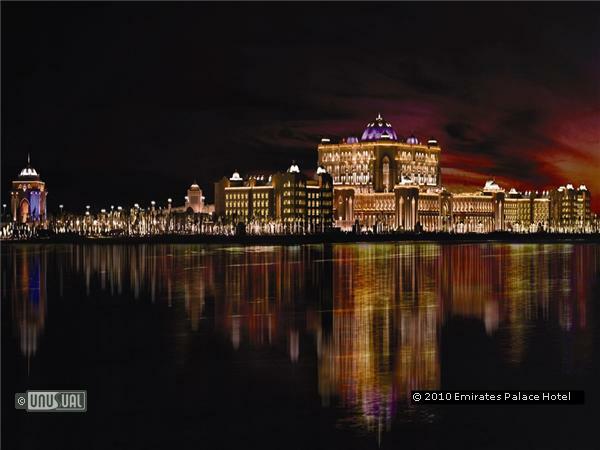 The Emirates Palace has hosted Opera, Classical Music and Pop music events from Coldplay to the Vienna Philharmonic orchestra both indoor and in the West Park open air concert arena. In addition, six large terraces and a variety of pre-function areas provide many possibilities for breaks, cocktail receptions and banquets. 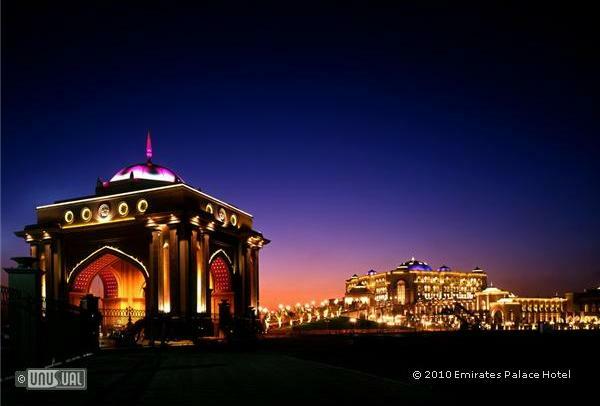 Set on 85 hectares of beautifully landscaped gardens with several open lawns, Emirates Palace offers spectacular outdoor venues for gala dinners and events. Abu Dhabi – an archipelago of nearly 200 separate islands where luxury and style are infused with traditional values of hospitality and respect. Sunny weather, tranquil beaches, lush oases, vibrant city life, and a mixture of culture and traditions come together to create a holiday experience like no other. Explore the emirate’s old souks, sip a fragrant Arabic coffee, ride the dunes on an exhilarating desert safari, or dive into a dazzling marine life - there is something for everyone in Abu Dhabi. 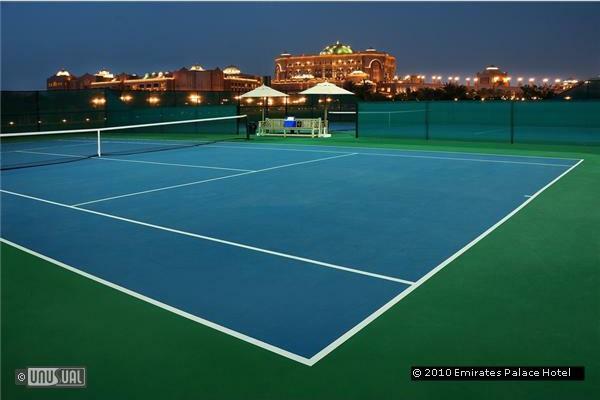 Yas Island is the emirate’s sports and leisure centre. 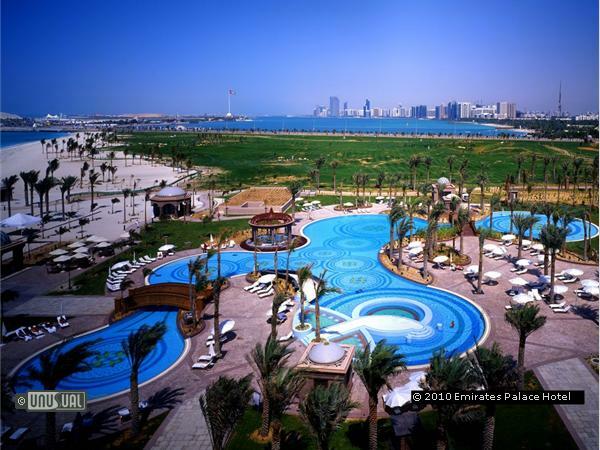 It is only about 30 minutes drive off Abu Dhabi, and is home to a Ferrari Theme Park, a Formula One circuit, a water park and several golf courses, polo fields, and an equestrian centre. It makes a fascinating excursion. Saadiyat Island, is 500 metres away from the main Abu Dhabi Island and will host to two of the world’s most recognised museums from 2011. The Abu Dhabi government is spending over $1 billion in the next few years to establish cultural landmarks on its doorstep. Guggenheim Abu Dhabi, designed by world renowned architect Frank Gehry, will be the biggest in the world, featuring modern and contemporary art. Louvre Abu Dhabi, designed by Jean Nouvel, will boast 6,000 square-metre galleries for permanent displays and another 2,000 square metres for temporary exhibitions. These galleries will exhibit major artefacts and works in archaeology, the fine arts and decorative arts. Guggenheim Abu Dhabi is set to open in 2011, and Louvre a year later. The most prestigious marina development in the Middle East, capable of obtaining yachts with lengths ranging from 12 to 90 meters and divided into 167 berth spaces. 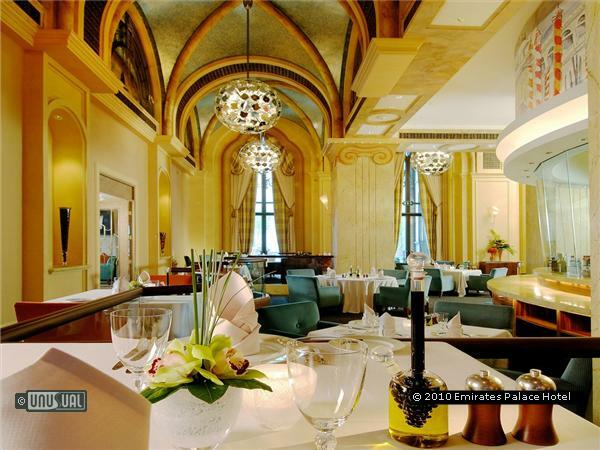 UAE’s first 5 star local restaurant, which provides the best Emirati cuisine that reflects true traditions and wealth of heritage. The Poseidon Underwater Suite at Atlantis the Palm in Dubai is no stranger to celebrity guests. Recently Khloe Kardashian was wowed by a visit - although she likely stayed as a comp''d guest, instead of about 60,000 AED a night or about $16,335 USD a night.